Back in 2004, Apple hobbyist/guru [Michael Mahon] built a cluster of Apple IIe main boards dubbed the “AppleCrate” as an experiment in parallel computing. Now that a few years have passed, he is back with a new iteration of the device, aptly named AppleCrate II. AppleCrate II was built to address some of the design limits of his first cluster project as well as to expand his parallel computing capabilities. His gripes with the first model were primarily structural in nature. The new system is organized in horizontal layers, using metal standoffs between each main board, rather than relying on a shaky wooden superstructure to keep things together. 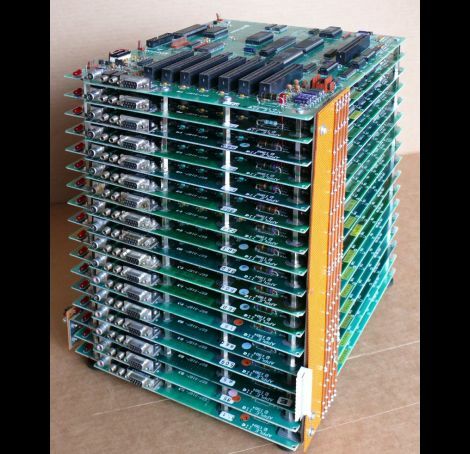 He also found his previous 8-processor configuration a bit limiting, so the AppleCrate II has 17 nodes – 16 slaves and one main board dedicated to running the operation. The cluster even uses his own homebrew networking stack known as NadaNet to enable communications between the boards. The project is pretty impressive, so be sure to swing by his site if you want to learn more. He has a ton of technical details there, as well as copies of all of the software he used to get the cluster up and running. Im my expirence motherboards allmost never fail. Its usualy harddrives that generate problems. And computers allmost never stop working from sitting in your closet colllecting dust. i wonder how well something like this could could work with apple IIc motherboards using the serial interface. apple ][‘s? You’d need two hundred of them to equal the computing horsepower of a cellphone. I was hoping to see a stack of 1U server motherboards. Those would have had 2000 times the performance of the ancient apple boards. Could this be done with the Commodore 64? You could make a monster synthesizer with all those SID chips! So now everyone needs to know, can it run DOOM? @mjrippe – I met some hackers in the late ’80s that set up a primitive C64 cluster of 8 systems IIRC. They built their own game cartridges with a turbo CPU, more RAM, custom ROM, and multiple serial connections. Very few hacks have impressed me as much, since then. a massive waste of time and…to call this an experiment… It would have been one 30 years ago but now…? Where did he find 17 Apple IIe boards? I would like to see this project merged with the Apple II Weather Display! Would be leaps and bounds faster updating! Where did he put the arduino? To the haters get over it. There are people that enjoy building hotrods using Ford Flatheads even today and other that race old Honda 350s from the 70s. It doesn’t matter that even that new stuff is faster they enjoy it. The creator has also built a pretty neat, cheap networking system for them. Too bad it will not work on the IIc but it is still pretty neat. And interesting project for someone would be too create an AVR or pic based USB or Ethernet to Nadanet bridge. Then you could use a cheap PC to act as a file server for the Apple Crate. This poor guy. His project already made slashdot and now this. As to the stand-off shearing. Yea I sure wouldn’t twist that stack. Call me crazy but i like the 8 node version of the song better. But then again I like chiptunes and stuff. I bet you could make some intresting synth music with one of these. You are correct, this is a conceptual experiment, not my attempt to break any speed records. It presents the user with all the asynchrony and communication/computation tradeoffs of any cluster, and does so at an almost human-visible speed and in the very accessible environment of Applesoft BASIC–a language that is perfect for few-page programs that do interesting things. I have provided NadaNet with a File Server–typically an Apple //e with a hard disk (now actually a CF card). Apple dropped the digital “annunciator” outputs from the Apple //c, so it would require a special and inelegant implementation of NadaNet to support that model. The same version of NadaNet works across all other models. six metal and three nylon (in the interior). This isn’t a serious experiment in constrained parallel systems. MCUs would have been better in every aspect for that. This is only art at best, and a fancy space heater at worst. “Serious experiment”? Hmmm. Well I didn’t do it for a government grant or my doctoral thesis, but it was undertaken with “serious” intent to learn something and have some fun with my favorite hobbyist computer, and it achieved its goals! Several parallel examples and performance studies are included in the documentation. It took less than two pages of Applesoft code to implement a complete peer-to-peer instant messaging system for NadaNet-connected Apple II machines, so the environment is pretty capable and quite productive. The Hacker Haters ball is on today. In this corner is Hacknasty who hates anything called a hack unless it uses electronic components with date codes older than 1985. Hotrods using old Ford Flatheads are still fast compared to consumer cars nowadays. Apple II computers are not. Thats why people feel its a waste of time. Good hack for 30 years ago, but not nowadays. You can make a car with an old Ford flathead go over 100mph and keep up with the mainstream cars of today. You can’t make a cluster of 1000 Apple II boards come close to the computing power of a mainstream pc of today. A hack is still a hack. It may not be using the latest things, but is no less a hack for it. Those computers were never intended for such things by any stretch of the imagination. @S734L7H Well, if there wasn’t any overhead in parallel computing and we hadn’t made advancements in a lot more things than sheer speed then a 1000 stack of apple IIs with parallel computer might be able to perform at a high fraction of 1GHz in terms of processing power. Besides, if we did the video display with the main system cpu too, we wouldn’t have nearly as much free cpu time. Frankly I feel that programmers (especially game dev) today have not been too forced to concern themselves with squeezing as much performance out of the system as possible. After all, every 2nd generation of games or even 1 generation change requires a new graphics card these days. I still have a 1989 IBM XT computer with a 20Mb HDD that weighs almost 20LB, lol. I still experiment with that :-P It’s good to know where we have been and what can be done with old tech. before you go thinking you are hot stuff because you bought a Dell.